Fully-automated certificate issuance, installation, and renewal makes things simple. 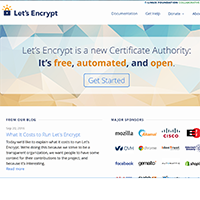 Let's Encrypt is a fully-automated CA issuing domain-validated certificates. They take all the hassle out of issuing, deploying, and renewing certificates. Using the "certbot" client from the EFF (other clients exist, but certbot is the reference implementation), I was able to automatically validate ownership of my domain, download the signed certificate, configure Apache to use it, and have everything working in less than 30 seconds. Renewals are easily automated with a cron job. For those who don't run their own server but instead use a hosting provider, many hosting providers support Let's Encrypt and can issue and deploy certificates in the site control panel in seconds.